Inspecting homes in North Mississippi including Olive Branch, Southaven, Hernando, Horn Lake, Nesbit, Desoto County, Marshall County, and Tate County & Southwest Tennessee including the Memphis area, Germantown, Collierville, and Bartlett. At HomeSpec, owned by licensed home inspector John Harpole, our top priority is making sure homebuyers don’t get blindsided by post-purchase expenses. We have been in the housing industry since the mid-80s and know exactly what to look for when helping our clients understand a home’s shortcomings and repair needs, as well as its strengths and charm. At the home inspection, we will gladly share our knowledge with you as we inspect the property and answer your questions. Our inspection services will give you the information you need to move in with confidence! Licensed home inspector Theo Andry works alongside John at HomeSpec. The pair often work as a team on inspections, making sure that all areas of the home are inspected with great attention to detail and with no need to rush. Between our two inspectors, no question about the property goes unanswered. 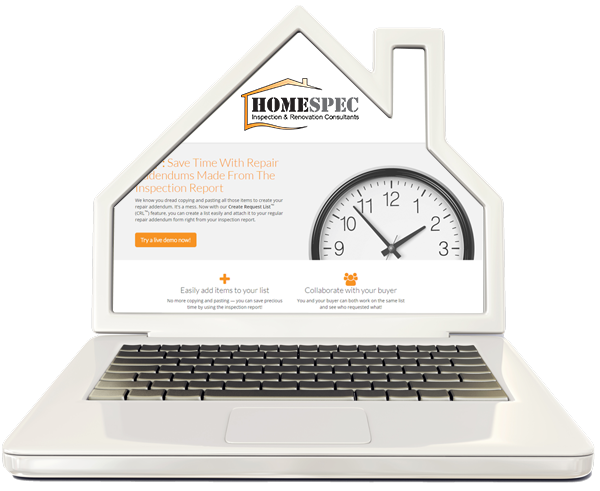 HomeSpec generates our reports using HomeGauge Software and delivers them to our clients by secure login within only 24 hours after the completion of the home inspection. Packed full of useful information, expandable photos, and video as needed, these reports leave home buyers feeling confident enough to request repairs and make closing decisions. Requesting your repairs is easy with the report’s featured CRL™ (Create Request List)™, which allows you to build a project list directly from our findings along with your realtor. Please call us upon receiving your report if you have any questions. We stop at nothing to help our clients understand all aspects of a property, which is why we include 360° images with each home inspection as a separate “HomeTour360” whenever possible. We use a 360° camera while at the property to collect images of the home’s layout as well as the front and back yards. These images allow our clients to virtually tour the home as often as they like while making decisions about it. It can be difficult to take in and remember every detail during your few times on the property, but thanks to this service you don’t have to! Contact HomeSpec anytime Monday - Saturday to schedule a professional home inspection!